I find it odd that, to my knowledge, almost all of Gary's work has also been pulled, and is not available. One would think that sales of his books would be one way for this fund to generate money, and further the legacy that we keep hearing needs protecting. From his own children, that is. Gary's works are owned by the Gygax Trust, a separate entity, even if Gail is behind both. Sure, but a "portion of all proceeds" statement. The whole thing is odd. I suspect she thinks the properties are more valuable than they are, and has attempted to get a better deal than his work is worth... so there's no deal, and she gets nothing. 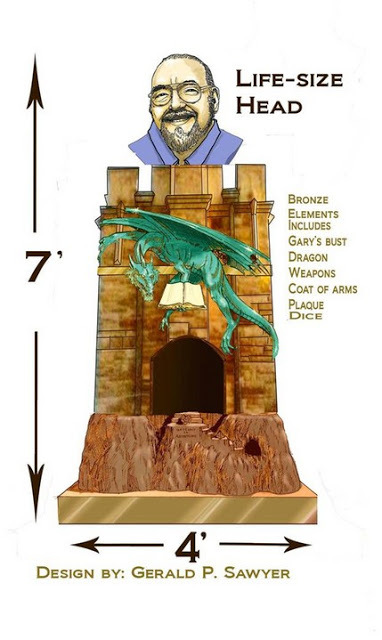 If that is the proposed monument design, then I can see why the Lake Geneva city council is not really high on putting it on display. That is one ugly eyesore. she has been trying to sell his properties to hollywood hasnt she? It's possible -- maybe even likely? -- that this deal is big enough to tie up the ability to sell any Gygax stuff for some time, and/or has some bigger announcement behind stuff being worked on behind the scenes. Given that none of the folks involved in the RPG industry know anything, though, suggests that either (a) any work will be done by outsiders to the industry, which is scary, or (b) there is no work on the RPG side of things and it's all just held up as part of the film deal. Or (c) I dunno. Strange to me that Spiderman hasn't swooped in here yet today.